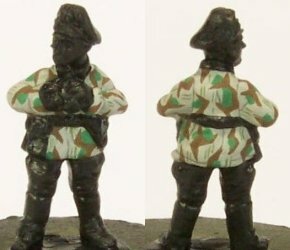 Someone asked me to explain a few months back (by e-mail) how I was painting splinter camo on 15mm figures. So a few pics & text = short tutorial of sorts. I might as well post it here too. 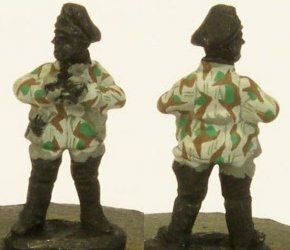 Painting Splinter camouflage on 15mm figures can be quite challenging but, with a little practice, is not nearly as difficult as it would appear. 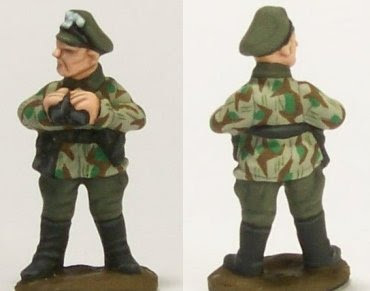 The way I paint it has been fairly similar for a few years now: the design painted on General von Sauken is very similar to that on the Volksgrenadiers, for example. I say "Heer" Splinter ("Splinter A") as I tend to paint the Luftwaffe variant ("Splinter B") a little differently. 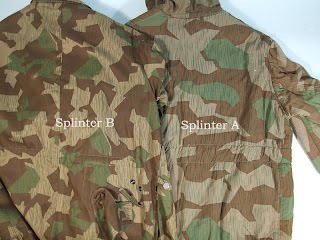 But that is just a personal choice: the pattern below is perfectly fine for Luftwaffe Splinter since on a 15mm figure we are not really painting actual Splinter camouflage, but rather a representation thereof. Note the slightly different patterns: Luftwaffe on left, Heer on right. A simple way to paint basic Splinter camouflage is shown by Evan Allen on the main Battlefront/Flames of War site. 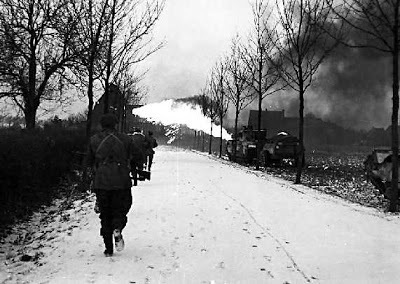 This was the method I used some years back on my old Luftwaffe Jaeger Platoon. It is fairly easy to do and does a pretty good job of representing the camouflage. Of course, I've improved a little since then, so I started looking for something a bit more involved. The Battlefront guide in the Art of War II (p. 27) had a decent guide, and the way I do it is pretty much based on that. After that, I block-paint with VPA Splinter Base. I tend to leave only a few shadow lines; leaving too many will make them visible later which will add more "noise" to the pattern. Just a few lines for definition works fine. After the base colour is done, I paint in brown camo lines with the VPA Splinter Brown colour. 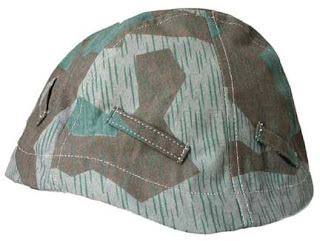 VMC German Camo Medium Brown is very similar and I have used this as well many times. Since we are not painting the actual thing, I try to suggest what the camouflage should look like. Keeping the lines/edges as straight as possible helps in this regard. I also initially paint over the belt, etc. trying to keep the pattern "coherent": the belt and other equipment details are picked out later. That being done, I add in the green splotches with VPA Splinter Green. Placing these so they look "correct" is still something I have difficulty with: looking at the real thing only helps so much. Again, I try to keep the edges of the patches as straight as possible, and not to add too much green. Lastly, I paint fine lines (aka "Splinters") in groups of 2-3 lines on areas where the base colour is showing through. I used Panzer Aces 348 "Splinter Strips" here, but any sort of dark-to-medium green-grey will work just as well since the lines are very fine. This is not strictly necessary, and of course is well out of scale, but I like the effect. Remember to keep the lines in one direction, as on the real thing. After that, the rest of the figure was completed. For figures wearing helmet covers, the process is much the same. The helmet covers were made from several pieces of camouflaged fabric sewn together, but I tend to ignore this fact in this scale and just paint. However, I add the splinter lines at different angles to suggest different pieces, plus it just looks better. On the figures above, you can see the difference between the Splinter Base used on the two figures on the left and the warmer tones of VMC Stone Grey (over Khaki) used on the right. Both variations can be used in the same force without difficulty. Adding darker base colours can also add variation, although from 3 feet away the difference will be minimal. My Desert Rat Rifle Platoon, figures from Battlefront's "BR790 7th Armoured Infantry" Blister. A bit of an oddity as far as detail and equipment go. 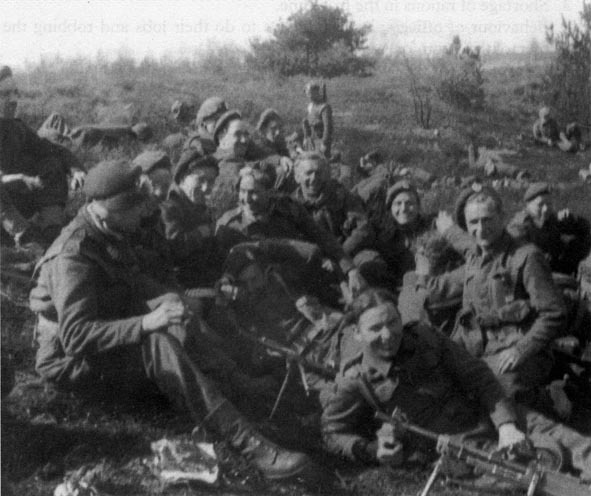 These are meant to represent, as far as I can make out, troops from 1st Battalion, the Rifle Brigade, in late 1944 or early 1945 where several pictures show the infantry wearing GS (General Service) caps, a large, floppy beret-like piece of headgear, even in combat conditions. Despite some misgivings, I thought I'd at least give the figures a try: mine are painted as a platoon from the 1st/5th Queens Rifle Battalion. Seth Nash sculpts and these, along with the Panzer Division Lehr infantry, are among the best he did for Battlefront. 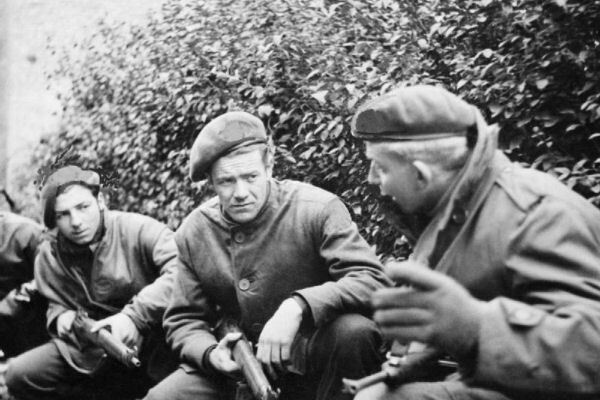 Infantry from the 7th Armoured Division, like most others, are most often seen in steel helmets, particularly where combat is expected. I think these are mean to represent men from the 1st Battalion, the Rifle Brigade, as they appear in some pictures in 1945. Despite some initial misgivings, I wanted to see what the figures were like and how they would paint up. 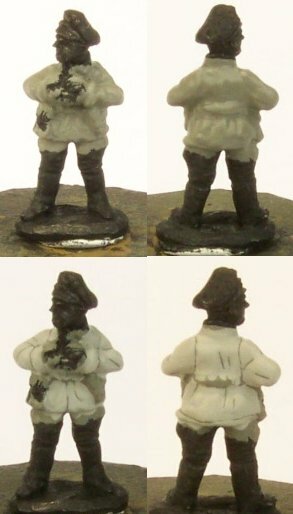 The detail is generally good, less exaggerated folds than the standard LW British infantry, good crisp details on the webbing and packs (a few enamelled mugs even present! ), better than Battlefront's standard LW infantry. The canteen is a little small and missing a strap but otherwise all right, entrenching tool very crisp. Rifles are a little odd: a mix of Lee-Enfield No. 4 Mk. I and No. 1 Mk III...very odd for Normandy, I think they should all be No. 4s. Stens and Brens present too, good detail on them. The odd figure in a jersey is a nice touch and two very good officer poses in the blister, only one pictured here though. Otherwise, the poses are a little stiff, a few look simply awkward. Mostly robust sculpts with strong weapons and ankles though, necessary when you want to file down Battlefront's awful thick bases without snapping figure off at the ankles. I painted these largely with my standard British colour, using Panzer Aces English Tankcrew and Highlight for the uniform. Cap badges on the GS Caps and Regimental and Divisional flashes suggested for a bit of colour: nice flat sleeves to paint some NCO markings on as well, so added a few of those too. Not the best range of figures Battlefront has produced by any mean. However, despite their obvious flaws, I can't help but like the figures: in their favour, they are study, robust, and well-detailed with decent, natural folds on the clothing. They have issues, but when painted up they look pretty good. 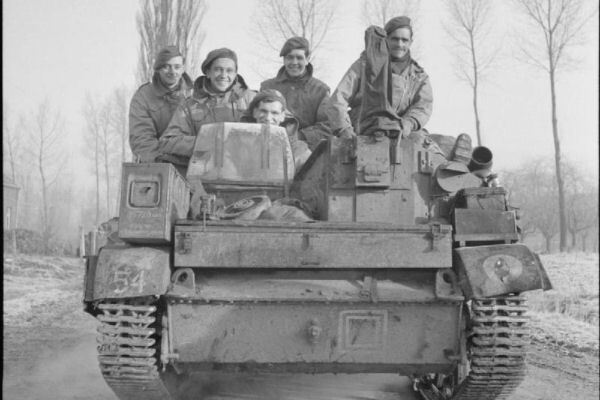 This platoon has already preformed sterling service in many games supporting the armour, so that may well account for my like of them! Just a quick post, really a primer for a longer tutorial that will follow. Soon. Next week. By Christmas. Etc. The idea here is to show a basic step-by-step of how I have painted vehicles in the "clean" style in the past. I say "in the past" because I am moving away from this style of painting, but I've had enough requests over the years to make doing a tutorial worthwhile. 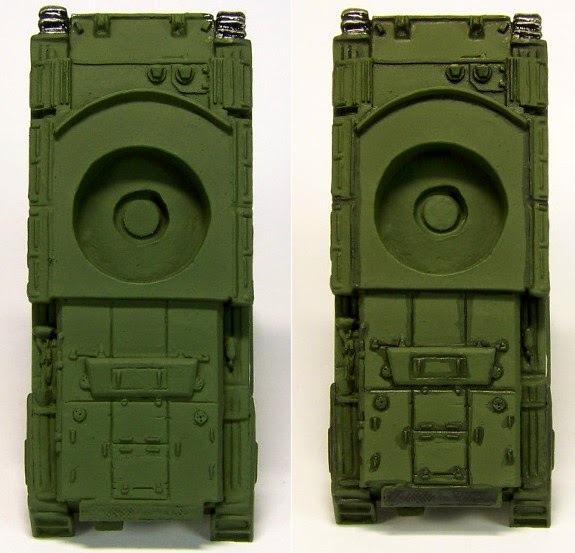 The pics are not very good, but this really is a stop-gap, just meant to explain the basic process: I intend to follow this article up with another where I'll paint a British Challenger tank from start to finish to match this painting style. It is much easier to see the effect on the "real thing" than on this small example. Still, painting panels in such a manner is good practice. I've used a spare piece of plastic BF Panzer IV shurzen here: undercoated black, I then painted it with an overall thinned coat of VMC 888 Olive Grey. A single coat of Olive Grey. Note patchy coverage. I then "pin washed" the panel lines with Army Painter "Dark Tone" Wash, (i.e. Badab Black or whatever they're calling it these days: see link HERE for comparisons). Thinned black paint or similar will also work, but a matte finish is a must. This is not a real "pin wash", basically I just paint it where the details are to darken and define them. Black wash applied on panel lines. I then follow this up by painting another, thinned, coat of VMC Olive Grey. Below I have left the panels to the left and right of the centre panel alone with only one coat of paint. You can readily see the difference, the second coat adds a level of intensity to the colour that a single coat lacks. The idea here is to "block paint" i.e. to carefully paint up to the lines without messing into them. This is a achieved by (1) brush control (2) thinned paint, but not too thin (about 1:1 paint water for me), and (3) by not loading the brush with too much paint which, if done, will result in control being lost and the excess paint running into the details. Less is more, as the saying goes. Light playing tricks here, still Olive Grey overall. After an overall coat of Olive Grey, I apply the SCC15 mix: a 1:1 mix of VMC 888 Olive Grey and VMC 924 Russian Uniform. This is a sort of "overall highlight", in other words I apply it over most of the previous colour, leaving some of the Olive Grey showing at the edges. This is how the "soft, smooth" look is achieved in part: thinned layers of paint helps too. Being applied in this way, the colour will, again, show a level of intensity which other methods (e.g. airbrushing) will lack, but this is neither here nor there, just different. Again, I have a left a panel in Olive Grey to show the contrast. Note the edges of the painted panels where the SCC15 colour is painted close up to them but not all the way. Once the entire thing is done, it is time for edge highlights. 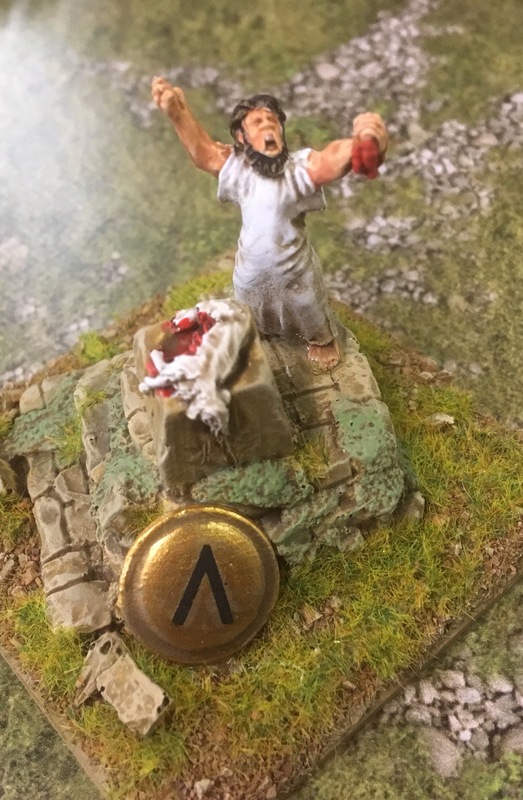 The theory here is, obviously, to highlight selected edges with a much lighter colour which will define details and edges and cause them to "pop" or stand out, especially from 3 feet away on the gaming table. These I applied on the shurzen on the "top" parts, a bit difficult to make out below. I highlighted the tops of the centre panels and the top and sides of those panels on the edges. I did not paint lines down the centre of the panels as this would essentially be wasting the previous effort: "framing a green box". 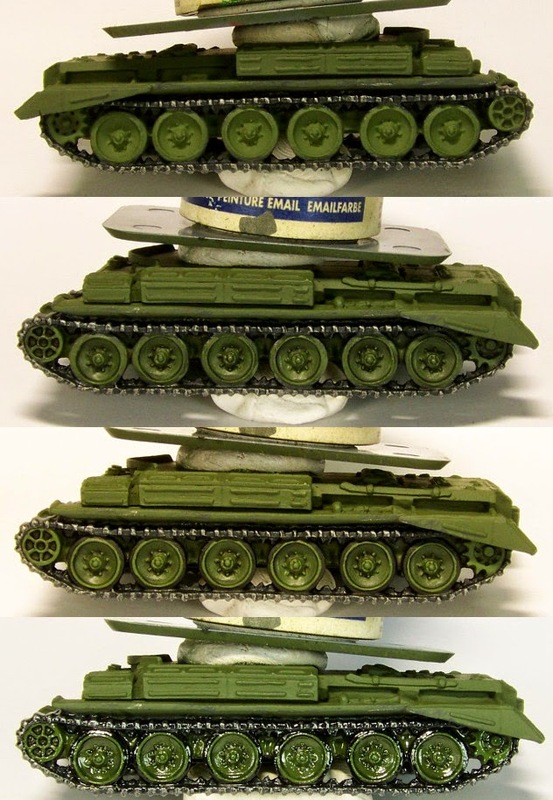 I used the Vallejo Panzer Aces colour 327 Italian Tank Crew: this is just like adding a light grey to the SCC15 mix, but is more convenient being straight from the bottle. That is pretty much it for the theory: I struggled to demonstrate this on something simple, it should be clearer on an actual vehicle I think. However, the basic process remain the same. I'll keep this short, as I'm bored of it and the process did not photograph very well with my lack-of-photography-skills. I've used two different models here to speed things up, but left them free of stowage, etc. for simplicity and to see what is happening. I worked from an overall black undercoat, then base-coated the entire model with VMC 888 Olive Grey with and airbrush, though in the past I've used a flat brush to quickly get some colour on the model. I did the tracks fist for simplicity. I painted the tracks black, then dry-brushed them quite heavily with VMC 995 German Grey, followed by a lighter dry-brush of a gunmetal (any will do). With the gunmetal I attempt to highlight the areas of the track in contact with the ground that would see the most wear and show as bare metal. After that, I painted the inside of the road wheels with the SCC15* mix and gave them an overall (thinned) wash with Badab Black/Army Painter Dark Tone "Ink" (it's not an actual ink, it is an acrylic wash). I then picked out the rivets and prominent points with SCC15* again, as well as the rim. Rubber was painted black, I didn't bother with grey highlights here as the matt varnish toned it down considerably. Panzer Aces Dark Rubber or similar is a good colour to use. I finish by gloss varnishing. With tracks and running gear out of the way, we can get to some actual painting. With the tank being an overall shade of VMC 888 Olive Grey, I start by "lining" the details with black wash, that is, I paint the wash into areas where there is detail. The picture-sequence of the hulls pretty much shows what I mean. I've included pictures of the turrets, the process is the same. Olive Grey on left, right with wash "lining" applied. After that I "clean up" by block-painting again with Olive Grey, leaving the black line where appropriate. You'll note that the new coat of Olive Grey is "greener" than the airbrushed coat, since it is applied by brush and the colour is consequently more opaque. "Lined" tank left, block painted tank on right. Next, I paint the SCC15* mix, leaving some of the Olive Grey showing around the edges in places, while pushing it to the edge of panels in other places. See the picture for example. Olive Grey on left, SCC15 applied on right. Lastly, I use line highlights to emphasise the edges, with Vallejo Panzer Aces 327 Italian Tankcrew. I also highlight the top of various ridges, rivets, and so on. SCC15 on left, edge highlights on right. The turrets follow the same idea. Side-shots of the hull progress. Lastly, I finish by painting other details (tools and equipment), gloss varnishing, applying decals, and the matt varnishing. This is the old way. I did my Cromwell-based force this way, but I'll be doing a Sherman Squadron with different techniques in future. * The SCC15 mix is a 1:1 mix of VMC 924 Russian Uniform and 888 Olive Grey.